Seminal research at Worcester Polytechnic Institute advances the field of regenerative medicine. Cell therapies for a range of serious conditions, including heart attacks, diabetes, and traumatic injuries, will be accelerated by research at Worcester Polytechnic Institute (WPI) that yielded a newly patented method of converting human skin cells into engines of wound healing and tissue regeneration. 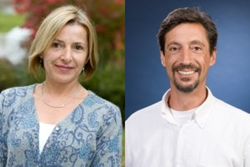 The novel method, developed by WPI faculty members Raymond Page, PhD, professor of practice in biomedical engineering, and Tanja Dominko, PhD, DVM, associate professor of biology and biotechnology, is described in U.S. Patent number 9,290,740, titled “Use of basic fibroblast growth factor in the de-differentiation of animal connective tissue cells,” which was issued on March 22, 2016. The technology enables adult human connective tissue fibroblasts (cells from skin or other tissues), which were previously thought to have a very limited lifespan outside of the body, to be cultured and replicated for long periods. It further causes those cells to express genes and proteins typically associated with stem cells, thereby demonstrating that the cells are in a less differentiated state. Notably, this technology works without inserting viruses or foreign genes into the cells. “This method is already being adopted by some groups working in tissue regeneration and we look forward to seeing it used widely by companies and research teams developing cell therapies and cell- and tissue-based assays for many indications,” Page said. One of the most active areas of research and clinical development today, regenerative medicine seeks to reprogram cells to repair the body. Examples of regenerative development projects now under way around the world include inducing skin cells to become contractile cardiac cells to treat heart attack patients; establishing new insulin-producing beta cells to treat diabetes; and growing nerve cells and spinal cord tissues to reverse paralysis. Furthermore, the newly patented culture method yields an exponentially larger number of regeneration-competent cells than was possible using previous culture systems. For example, with slight modifications, the team successfully applied this system to adult human skeletal muscle tissue, culturing cells in large numbers without losing their potential to differentiate into contracting skeletal muscle, thus maintaining regeneration competence. With previous culture methods, muscle-derived cells lose nearly all of their ability to become contractile cells after 20 or more- generations. With the method developed by Page and Dominko, however, cells from similar tissue can maintain regeneration competence for 70 generations or more. That increases the yield of regeneration-competent cells a trillion-fold over a typical cell culture process. Dominko, Page, and several colleagues at WPI continue their research on developing regenerative-competent cells for wound-healing and other therapeutic indications. For a look inside the Dominko lab, see this video. 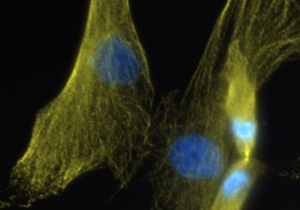 Human fibroblast (skin cells) undergoing cell division in culture in the lab of Tanja Dominko.